As Your Own and Earn 6% Upon Sale. Broker Seeks Marketing Partner / You are cordially invited to participate in an exclusive sales and marketing opportunity for the prestigious properties shown on the sidebar to the left: custom homes, estates, and resort-oriented residences. By your participation you will gain the many benefits of advertising one or more the subject properties in your portfolio of offerings as though they were your own listings. On those shown as Co/Marketing (Plus), you can earn a Six-Percent (6%) Sales or Referral Fee in lieu of the two and one-half percent (2.5%) sales fee offered through the standard Realtor's MLS for each. Authentic Co/Marketing Opportunity / The owners of these properties have opted-in on Broker Al Lewis' radiant-outreach network marketing program, a self-generated multiple listing service authorizing Broker to create co/op sales and marketing arrangements with select center-of-influence (1) Brokers (2) Agents (3) Attorneys (4) Lenders (5) Select Escrow and Title Vendors (6) Home owners local to a subject property with a real estate license whether active or not and (7) Many other niche markets inside networks of buyers with means, and to offer an over-the-top commission (Six Percent / 6%) upon the successful sale of a subject property by their direct-or-referral sales and marketing efforts. Build Your Portfolio in Eight Easy Steps / Upon authorization, you can advertise and promote the subject properties any way you deem appropriate and beneficial to your business utilizing (1) Photographs (2) Illustrations and (3) Copy (4) Including placement of the properties on various internet websites and (5) Social Media services in your name, except the standard Realtor's multiple listing service reserved for the exclusive agent (6) You can schedule and host Open Houses, Group Previews and Tours for interested buyers both weekdays and weekends, and (7) You can use content on the websites indicated or property brochures found at each site any way you deem appropriate (8) You can copy (or capture) and personalize the information with your name, company and phone (Make Them Yours). The properties can be shown any time during normal daytime or evening hours with advance notice. Call direct to arrange times for Broker and/or Owner hosted previews and tours. Call 714-744-0617. Six-Percent Sales or Finder’s Fee Agreement / To take advantage of the opportunity to market these properties as if they were your own listings, please send an eMail to Al Lewis direct at, AlLewisMarketing@gmail.com, to request and receive an exclusive cooperative marketing agreement, one for each property requested, that will authorize you to do this, personalized with your name and company, and authorized for your file. 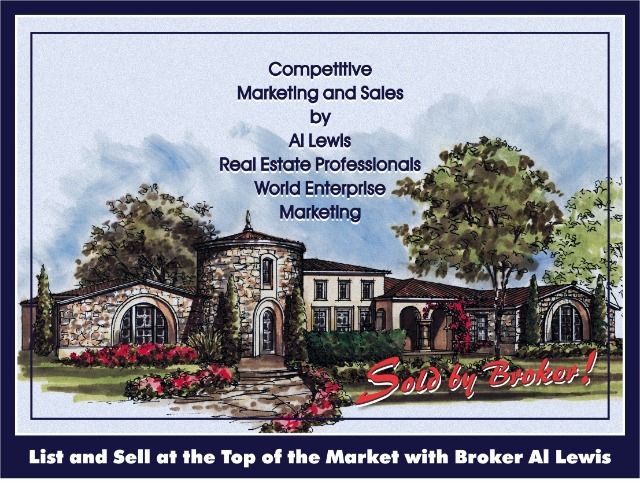 Not IDX / California law requires written authorization from one broker (the exclusive listing agent) to another (the co/marketing agent) before the co/marketing agent can market the listings of another as though they were exclusive listings of their own without showing the listing broker's personal name, company name and contact data. Act Now / Only action determines your value in the marketplace. To multiply your value you need to multiply your actions. Success will not wait on you. When you delay she becomes wedded to another and lost to you forever (Act Now).